How will our parenting decisions today affect the adults our children will become tomorrow? Molly Skyar, in an open conversation with her mother, Dr. Susan Rutherford, views parenting decisions through a psychologist's perspective. I work from home and have a hard time separating my work-life from my home-life. DR. RUTHERFORD (Molly’s mom): I see this issue is becoming more and more prevalent as technology advances and more and more parents are able to work from home rather than going outside the home to work. MOLLY: This question was submitted by Jill Smokler, the founder of the highly successful and popular parenting blog, Scary Mommy (I think it’s a must-read for all of us to help keep our sanity and have some good laughs too). I, too, work from home and can relate to this question first-hand. Last year, I hired a babysitter for when my kids would get home from school in hopes that I could try to stay in my office and continue working after 3 pm. That turned out to be a fantasy as my kids knew I was home and would come into my workspace to climb on me and then refuse to leave my desk. They would get really upset when I tried to send them downstairs with their sitter. As a result, I often found myself running over to my computer to check emails or complete other tasks while trying to juggle the kids and their needs. Everyone was frazzled and no one felt satisfied. DR. RUTHERFORD: I remember when that was happening. If I recall correctly, I suggested that when they got home from school you came to greet them and spend the next 10-15 minutes listening to them talk about their day. This would give them a chance to satisfy their need to have immediate contact with you and to connect by sharing their experiences. I thought you could prepare them a snack, sit at the table together to eat, and give them 100 percent of your attention for about 15 minutes. After that, they’d be more ready to have some time for themselves and you could say that it’s time for mommy to go back to work now and escape back to your desk. MOLLY: I did start doing that and, in fact, noticed immediately that it helped stop the struggles. They stopped complaining that I was always working and were able to settle in more comfortably for the rest of the afternoon without my physical presence. DR. RUTHERFORD: Look at that: by devoting just 15 minutes of time to greeting your children and giving them your full attention, you freed up many more uninterrupted work hours. MOLLY: It can be a brutal tightrope: it feels like I can’t give as much as my job demands and needs, yet I also can’t dedicate enough time and attention to my children as they want and demand. DR. RUTHERFORD: I think it’s very very hard to complete tasks for a job while taking care of children at the same time, forget doing them both well. When you work from home and have responsibilities beyond just taking care of a house and a family, it’s a different experience than going off to an office where your time is clearly delineated for work only. It’s much harder to dedicate yourself fully to and complete work tasks when you’re also accessible and responsible for young children, and often both must be attended to at the same time. 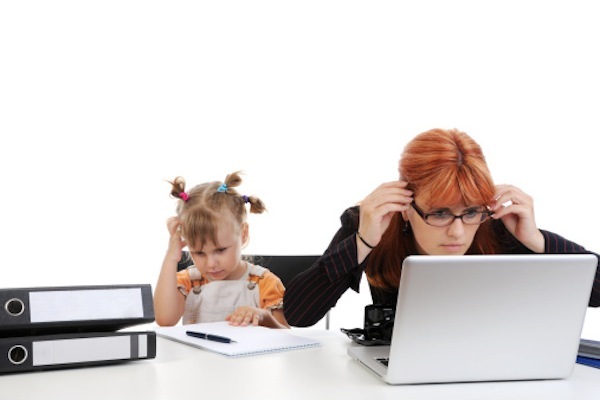 Indeed I think that work-at-home parents often feel like they’re working all the time as a result. MOLLY: I know from my experience that my 3- and 7-year olds can not grasp the concept that they might need to be quiet for a work call. In fact, they seem to be especially needy as soon as I get on a professional call if they are around. DR. RUTHERFORD: Right, they have their antennae up and they know. MOLLY: Still, I can see so many benefits to being able to work from home including all the time I save from commuting (a serious time commitment in a big city like Los Angeles, where I live) and the time and expense of dressing for a professional workplace. Not to mention that I don’t have to deal with office politics anymore – I always hated that part of corporate life. DR. RUTHERFORD: Agreed, and in exchange you have to be very disciplined about organizing your time. If your children are in school then you can try to dedicate yourself to working during school hours rather than trying to conduct business calls during after-school hours when they are home. I thought you were smart to hire the sitter for some extra hours last year when your youngest was only in school for half of a day. MOLLY: It still feels like I never have enough time to get everything done. DR. RUTHERFORD: When you don’t have clearly defined working hours, that feeling is almost impossible to avoid because there will always be something else that could be worked on at any given time. The key to helping children accept and learn that their parent might have responsibilities or interests outside of their family is to make sure to spend some undivided time re-connecting after having separate experiences. This is true whether the parent works outside the home, from the home, or not at all; indeed, it’s a technique to use anytime the children have experiences without the parent –including going to pre-school or school. I remember when your sister was two years old and I was teaching at the medical school. When I would come home and rush around trying to get dinner prepared, your sister would be hanging all over me and whining. I finally realized that if I stopped and spent 15 minutes of undivided attention with her when I got home, she would be able to calm down and play with her toys or color while I took care of things in the kitchen and put food on the table. It comes back to the primal issues for children of feeling secure in your parents’ constancy in order to feel safe to go back out and experience life on her own again the next day. It just takes a few minutes of complete attention to satisfy this basic need in a child, and satisfying it will allow the child stop feeling so needy. Which will then allow the parent the space to do what she needs to get done. This is a good reminder that sometimes simply pausing life to listen and give focused, undivided attention can be a remarkably effective technique for raising happier children. This is a really interesting conversation and addresses things I think a lot of parents struggle with.